Please complete this form and submit it ONLINE regardless of how you intend to pay the application fee. You must be 21 years old or older to apply. After you complete and submit this form you will see information about submitting your non-refundable application fee for $10 (Check, Money Order or Paypal). If paying by Check, print out the form using the "Print" button at the bottom of this form before you submit it and mail it with your check. No adoption fees will be refunded after seven calendar days. BROOD adopts dogs to residents of Maryland, West Virginia, DC, Delaware, Virginia and parts of Pennsylvania ONLY. We do not serve North Carolina, Tennessee, Ohio or Kentucky. 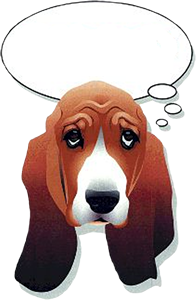 If you are applying from a state other than DC, VA, WV, MD, DE or Southern PA, have you contacted the basset rescue in your state? We encourage you to apply with them first. Please check this site for a basset rescue in your area. If you do not have a fence, where and how will the dog be exercised and allowed to use the bathroom? Do you agree to keep the basset on a leash when outdoors? We will contact your vet to verify. BROOD requires that existing dogs be on heartworm preventative in order to adopt. If yes, what happened to the dog, or any other dogs you have owned. What would you do if your cat did not get along with a new dog? Have you ever returned a dog that you adopted or relinquished a dog you owned? If yes, what were the circumstances? Please provide name, address, phone and contact person's name (if known) of the agency to which the dog was returned. Experienced. I have housetrained multiple dogs and attended obedience classes, and feel comfortable with housetraining and providing basic manners training for a new dog. With your 24PetWatch microchip for your adopted BROOD dog, 24PetWatch offers you free lost pet services, as well as exclusive offers, promotions and the latest information from 24PetWatch regarding microchip and insurance services. Pethealth Services (USA) Inc., Pethealth Services Inc, PTZ Insurance Services Ltd. and PTZ Insurance Agency Ltd may contact you via commercial electronic messages, automatic telephone dialing systems, pre-recorded/automated messages or text messages at the telephone number provided above, including your mobile number. These calls or emails are not a condition of the purchase of any goods or services. You understand that if you choose not to provide your consent, you will NOT receive electronic enrollment notification regarding the trial/gift/voucher of insurance and/or free LOST PET SERVICES which includes being contacted with information in the event that your pet goes missing. You may withdraw your consent at any time. All the information I have provided on this application is, to the best of my knowledge, true and complete. I understand that falsifying information on this application, or at any other time during the adoption process, disqualifies me from adoption. I am aware that submitting my application does not guarantee that I will receive approval to adopt a dog from BROOD and that BROOD reserves the right to reject any applicant at any time during the adoption process. I also understand that the $10 application fee is non-refundable.